One of the advantages that comes with building various products for WordPress is getting to meet a lot of different people working on interesting things. Some are developers, some are bloggers, some are contributors, some are editors – there’s a wide variety of people using the platform in many different ways. If you’re acting as an editor, you have a number of responsibilities: you have to curate content, create, edit, and schedule posts, work with a team of authors, and, in some cases, make sure that your server and associated environment is up-to-date. If you’re an editor, WordPress leaves a bit to be desired when working with a team of authors. 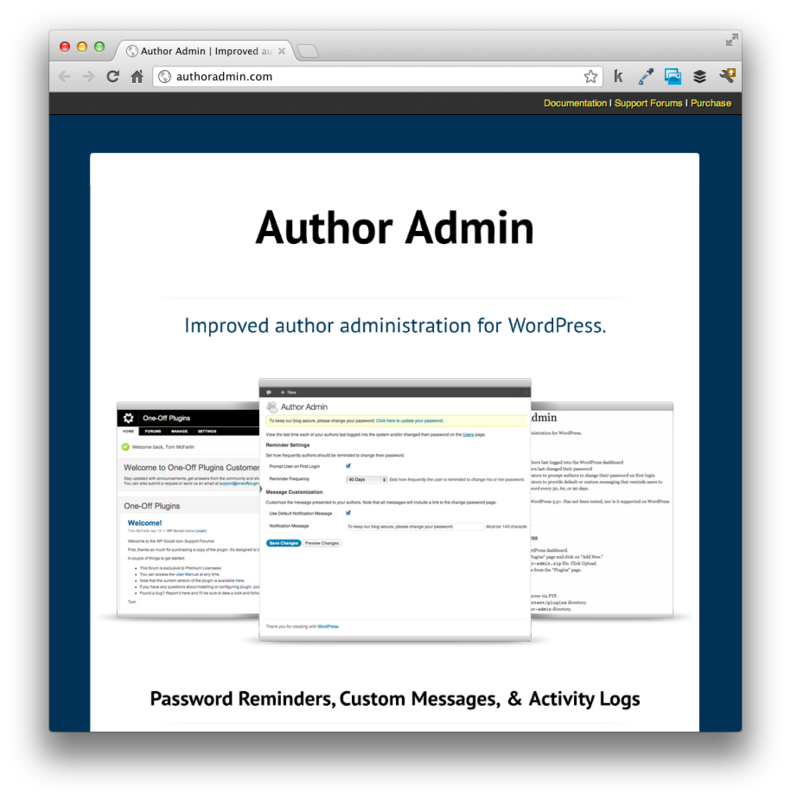 Author Admin is a premium plugin that attempts to mitigate that problem by adding improved author administration for WordPress. Compatible with WordPress 3.3+. Has not been tested nor is it supported for WordPress Multisite. The yellow dialog is the notification preview triggered by the Preview Changes button at the bottom of the page. You can access the All Users page by clicking on the link in the first line of the options page. This allows you to view the author activity. The Message Customization settings allow you to use the default customization option or the custom message that editors may define. The plugin introduces two new columns to the All Users page. The Last Login column displays how many days it has been since the author has last logged into WordPress. The Password Changed column displays how many days have passed since the user has last changed their password. For more information, to purchase the plugin, or to view the documentation, check out the homepage. 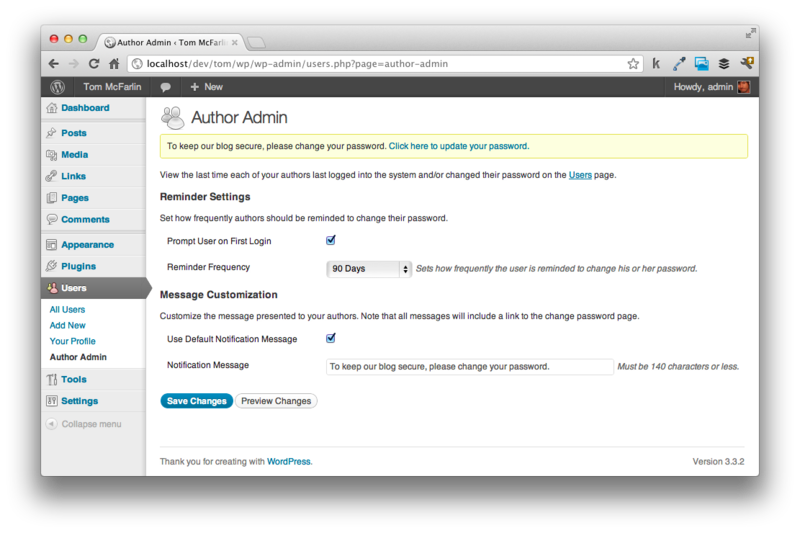 Author Admin was built using the Settings API and the Plugin API and follows the WordPress Coding Standards. This ensures maximum compatibility with the WordPress platform and that every effort has been made to build quality into the plugin. Author Admin is released under the GPL. Special thanks to Ryan Imel of WPCandy for serving as a beta tester and providing useful feedback for the user experience of the options page, and thanks to Eric Dye of ChurchM.ag for testing the plugin against a larger pool of contributing authors.